If you ask Ken Smith how he got interested in lighthouses he will tell you, "I met a girl!" 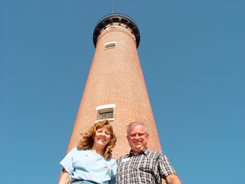 One of his first dates with wife Dede was a climb of the Ponce Inlet Lighthouse. He got hooked (on lighthouses and the girl). Ken currently serves as president of the Florida Lighthouse Association (FLA), which is dedicated to the preservation, restoration and protection of Florida's 30 remaining historic lighthouses. Through fundraising and two grant programs FLA helps support bricks and mortar restoration, promotion and educational programs undertaken by the various local preservation groups in Florida. He is currently working on editing an update of the late Tom Taylor's book, "Florida Lighthouse Trail" for Pineapple Press. Ken is fourth generation born in Florida with family members in the commercial fishing and shipping industries, which also helps explain his intense interest in Florida maritime history. Ken graduated from the University of South Florida with a degree in communication. Professionally, he is an award winning TV producer, having worked for several TV stations and networks early in his career and then as a freelance producer. He currently is a project manager with PSAV Presentation Services. He currently is managing and producing live events.